Breast is the number one problem we encountered at CA Care. According to statistics by the American Cancer Society (ACS), the chance of developing invasive breast cancer at some time in a woman’s life in the United States is 1 in 8 (12%). About 290,170 new cases of breast cancer (invasive and carcinoma-in-situ) will be diagnosed in women. About 39,510 women (i.e. 13.6%) will die from it. I wish science can tell us why women’s breasts are so susceptible to cancer attack. As it is now, in spite of our amazing scientific progress, women are just left in a limbo – uninformed and clueless. According to Karen Stabiner, a woman’s life is a roulette, when it comes to breast cancer. In the first two weeks of February 2012, many women with breast cancer came to us for help. The most pathetic cases are those who gambled their lives with their breasts. Let me give you some examples that I we saw the past two weeks. A biopsy was performed and it was confirmed an infiltrating ductal carcinoma. SD was asked to undergo a mastectomy – to be followed by chemotherapy and radiotherapy. She refused and came to seek our advice on 5 February 2012. Our advice: Go and get the cancerous breast lump removed. Her response: She was disappointed. She expected us to prescribe her some herbs and make the lump disappear! Unfortunately, we cannot do that. We sent her home without any herbs. Come back to us after the surgery if you need our help. Case 2: JL (S99) is a 37-year-old lady. About ten months ago, she felt a lump in her right breast. She did nothing about it. The lump grew bigger and began to hurt. Then she came to Penang for consultation. A biopsy was performed and confirmed a Grade 2 infiltrating ductal carcinoma. Because of its large size, JL was asked to undergo a few cycles of chemotherapy to shrink the tumour. After that she needs a mastectomy. Our advice: As much as chemotherapy is difficult, you have no choice. Go for the chemo and have the breast removed after chemo has shrunk the breast. Case 3: BM (S107) is a 66-year-old Indonesian lady. Two years ago she had a big lump in her left breast. She did not consult any doctor and took upon herself to solve her problem. She took Linzhi and various supplements. The lump grew bigger. Only then did she go to see a doctor who asked her to go for chemotherapy. She refused. She turned to herbs and this time took “Sarang Semut”. After one and half months, her breast developed open wound and discharged a lot of blood. She came to seek our advice. Our advice: Go and see a surgeon and have him/her remove your breast. The surgeon would probably ask you to go for chemo first to shrink the tumour before he/she could do anything. But you have no choice. Her response: She would probably follow this advice. Case 4: Zar (H805) a 40-year-old lady. In February 2011, she felt a lump in her left breast. She went to seek the help of the “bomoh” (local traditional healer or shaman). She was given “something” to drink. The lump did not go away but grew bigger instead. When she came to seek our advice the lump in her breast was large and hard. Our advice: Go to your doctor and have your whole breast removed. The lump is too big. My herbs is not going to make it disappear. Her response: She agreed to the surgery. Why do these women let this happen to their breasts? Study the pictures below. Why do these women above allow this to happen to their breasts? Could it be that they are ignorant? Can it be that they have so much fear or are in denial mode and are not prepared to face reality? Or are they just being plain dumb. I cannot answer that question. They should know better than me. But my job is to help them understand and go through this trauma before it is too late. We can learn two lessons from the stories of these women. One, it is best to get your breast lump removed when it is still small. Don’t wait until it gets bigger as you will end up with more problems like the picture above. OK, if taking herbs or supplements makes you feel good – I could agree for the sake of satisfying your curiosity. You can test your luck for a few weeks and see what happens. If the tumour persists and starts to grow, that means what you are doing is not effective. Why be so dumb not see the truth? The longer you wait, the bigger the tumour will become – why allow it to grow so ugly like in the pictures above? “Abandon ship” quickly and look for a surgeon. Many patients come to us with their “bad” breasts hoping that our herbs can make the tumour (s) disappear. This is indeed an unrealistic dream. They come to us because they have the impression that CA Care is anti-doctor and that we would never advise them to go to the doctors. Let me say this very clearly – CA Care is not anti-doctors. At CA Care we ask you to do whatever with your best interests in our hearts. We are not dogmatic or an alternative medicine fanatic with a fixed ideology. We ask you to go for treatment that (in our experience) would help you best. I know some women are disappointed after we tell them what they don’t want to hear – they only want us to tell them only what they want to hear. In my earlier article, Breast Lump: Get It Out I have given two reasons why I thought the tumour has to be removed surgically. One, is a psychological reason. When the lump is physically gone, you don’t see or feel it in your breast anymore. Two, the herbs, change of diet, exercise, prayer, supplements, etc., cannot make a malignant tumour disappear. The bigger the tumour, the chance of it disappearing is even more remote. Make no mistake, surgery may not cure your cancer. In cases where the mass is still small and the cancer has not spread elsewhere, the chance of “cure” is very high. But if the lump is already big, it is most likely that the cancer has already spread or metastatised. Amy Soscia died after fighting a battle with her breast cancer for 13 years. After the surgery, the standard protocol of the doctor’s comprehensive treatment package is to ask you to undergo chemotherapy, radiotherapy and hormonal therapy (depending on your hormonal status). Unfortunately these invasive treatments have earned bad reputation. Many women dread to go through such treatments. This is where I differ with the established medical way. Doctors claim that what they offer is scientific and proven. At CA Care I have helped breast cancer patients using non-invasive holistic method of healing. This works. 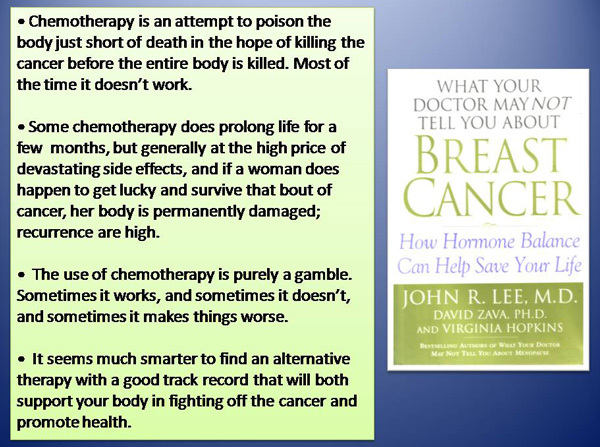 Read my book, Breast Cancer – the Herbal Option, if you want to know more. Generally women who have failed to find “cure” after undergoing all their medical treatments would come to us as a last resort. I tell them this, I am not god – I can only do that much. But I shall try my best to help. Make no mistake. I don’t claim I can cure your cancer or I have a magic bullet for your cancer. Almost all patients who come to us have gone through medical treatments and they cannot find a cure. So to me, only a fool would claim that he can cure cancer. My experience tells me no one on earth can cure any cancer. What I mean is advanced stage cancer – the ones we often encounter at CA Care. So why is CA Care around then? Over the past 16 years, we have helped many cancer patients find their healing – “hopeless” patients regained their health and could lead a normal life in spite of being told by their doctors that they only have 3 or 6 months to live. Take time to read the healing stories in our website: www.cacare.com and www.CancerCareMalaysia.com and you know what I mean. Understand that healing is different from cure. Reflect on the quotations below. Chris: Let me ask you this question – if you were to start all over again from 2009 when you felt the lump in your breast – what would you have done? Le: I would come to see you. I would not want to go for medical treatments. When you had that small lump, you went to see the doctor but why did you not want him to do something for you? Le: I went to see a “sinseh”. He told me I had this disease because of my sins. What kind of “sinseh” was that? What I wanted to know is, do you know that if you have a cancerous lump in your breast, the best option is to have it removed by the doctor? Le: If I were to have met you then, it is most likely that I would follow your advice and have the lump removed. Because after that I can take the herbs, okay – that I would agree. But I don’t want to go for chemotherapy or radiotherapy after the surgery. Unfortunately, I did not know about you then. I fully understand why many women are scared stiff to consider undergoing such protocol – The treatment is worse than the disease! When we started CA Care we “pushed” patients to go for chemo and radiation after their surgery. In short, do what their doctors want them to do. However, over the years I have seen many failures and disastrous outcomes of these invasive treatments. I have realized that I was wrong to have abetted patients to go fully the medical way. I have since learnt my lesson and changed my stance. Now I would not actively urge patients to go for any invasive and poisonous treatments. It must be the patient – and the patient alone – who makes that decision if she wants to undergo chemotherapy and/or radiotherapy. I would NOT oppose or urge anyone going towards that direction. Whether to go for chemo or radiation must be your own decision. Please don’t ask me what to do. I cannot answer you that. My responsibility is restricted to providing patients with honest and unbiased facts about these treatments based on my reading of medical literature. I believe in evidence-based medicine. With that I need real evidence and not biased, academic or theoretical perceptions. To me, there is no meaning in saying: The treatment is a success but the patient died of complications, or the patient tolerated chemotherapy well. I take seriously the wisdom that the test of the pudding is in its taste. When a patient dies or is not cured, it is a failure (of your claim to cure) – no more, no less. And why can’t we learn to accept failures and be honest about them? This entry was posted in Breast Cancer and tagged breast cancer, herbal option by CA Care. Bookmark the permalink.